A young woman stood before a group of children outside a community center in South Royalton, Vermont, and asked them, “Do you like my pack?” It was an extraordinary pack, stuffed to the brim and beyond. A teddy bear peeked out from under the top flap between a fluffy pillow and a yoga mat. A light saber and a big hand mirror stuck out of the pack’s outside pockets. “Am I ready to go hiking?” she asked the children gathered around her under the shade of several trees. The tall young woman, her blond hair pulled back in a ponytail, was a summer intern with the Upper Valley Trails Alliance. Together with the nonprofit One Planet, the Trails Alliance was teaching the children what to bring — and not bring — on a hiking trip, including what to wear. Kelen, the intern, wore a flouncy yellow skirt, clutched a straw purse in one hand, and had wrapped a pink feather boa around her neck. 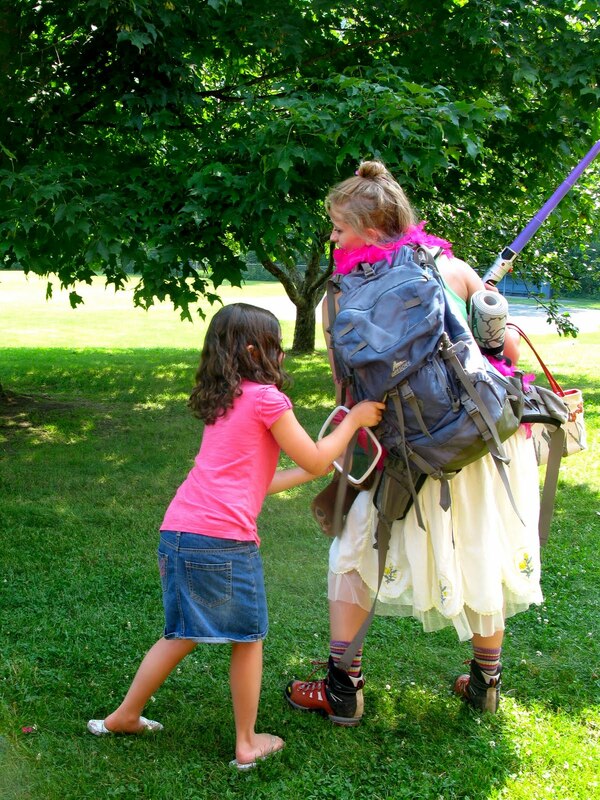 Chances are, none of the children had ever seen a hiker quite like Kelen. Some of the children were just out of kindergarten. Others would soon be starting middle school. But all of them knew when someone needed their help. “No!” they shouted. At that, Kelen invited each child, one at a time, to come up to the front of the room and get her properly outfitted for hiking. In quick succession, they divested her of the feather boa, the purse, and the yellow skirt, revealing hiking shorts beneath. Next, they moved on to her giant backpack, choosing which items would go into a smaller daypack. Out went the teddy bear, the yoga mat, and a crazy cornucopia of other items. If something didn’t go in the smaller pack, the child got to hold it on his or her lap. “Why can’t I bring my mirror?” Kelen asked when a small girl shyly pulled it from the side pocket. “How can I fix my makeup without a mirror?” “You don’t need makeup on the trail!” children shouted happily back at her. The light saber prompted a careful discussion. Several boys made an impassioned pitch for keeping it — it’s light, it’s fun, you could play games with it on the trail — but eventually it, too, was cradled on a child’s lap. - Read “Essential 3-season hiking gear for Northeastern hikes” and “Ten Essentials for a Safe and Pleasant Hike” from AMC Outdoors. Photo credit: John Taylor, UVTA.